A sweet treat your guests will love. 1. Preheat the oven to 180°C/gas mark 4. Lightly butter 2 x 12-hole patty tins and set aside. If you have only one tin, then assemble and bake the pies in two batches. into a smooth ball of dough. Flatten into a disc, wrap in cling film and refrigerate for about 20 minutes. the pastry becomes too soft to work with, pop it into the fridge or freezer to firm up again before continuing. 5. Press the discs into the greased patty tin holes. Spoon the cranberry sauce evenly between them, about 10g each. Spoon 1 tablespoon of the frangipane on top of each one, spreading it level and to the edge. Scatter the coconut over to stick. 6. Bake in the oven for 20 to 25 minutes, until the frangipane is pulled up, golden and cooked through. Leave the pies in the tins for a few minutes before carefully removing. 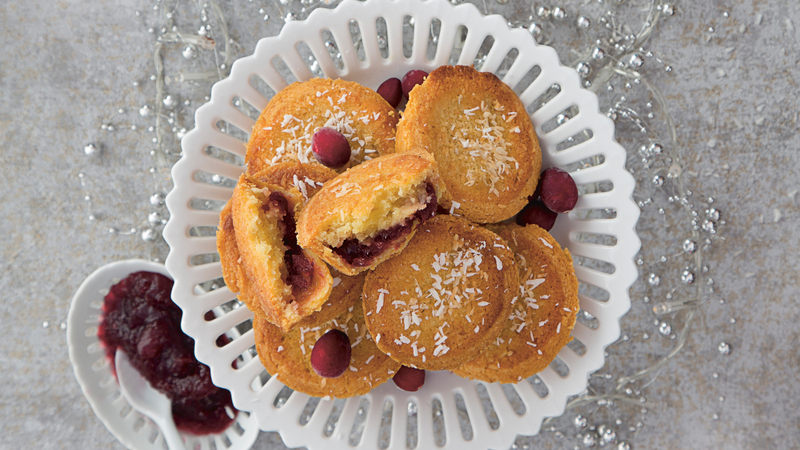 Dust with the icing sugar or a little extra coconut and serve warm with brandy butter, whipped cream or custard.